If you ever wondered if healthy snacks could taste good, this trail mix is the answer. It’s a colorful, texturally-diverse, tasty combination of earthy-flavored small, green pumpkin seeds, buttery flavored nuts and sweet, chewy, slightly wrinkled dried fruit. Its visual appeal is not its only claim to fame. The abundance of nutrition it offers also makes it amazingly impressive. Raisins, Almonds Roasted Unsalted, Cashew Pieces Roasted Unsalted, Sunflower Kernels Roasted Unsalted, Pepitas Roasted Unsalted, Sunflower Oil. Happy for a healthy convenient snack such as this. I think it is a little seed heavy and would benefit from a few more raisins or other dried fruit.. but I added some and now it is great! 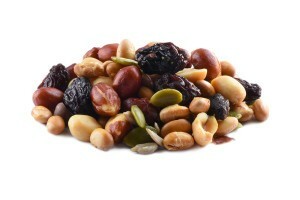 Taste and flavor are really good – good mix of nuts, seeds and fruit. It doesn’t show any added oils on the list, but there does seem to be lot of oil on my hands after eating them? 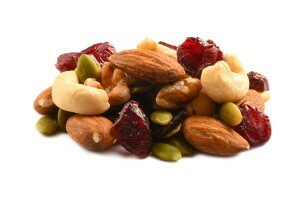 Love this trail mix by the handful or in the morning mixed in my I oatmeal. So good. This is a very good trail mix. I loved the sunflower seeds. This mix will be on out re-order list.